I've been using f.lux for a while at home. At work I decided to set up a portrait mode display for my two screens. However that doesn't seem to play nice with f.lux, and I'm curious whether this is f.luxes doing or the screens themselves. The problem is that it introduces a noticeable color fade that runs horizontally across the screen. The right part (top) of the screen is darker/redder than the left part (bottom). 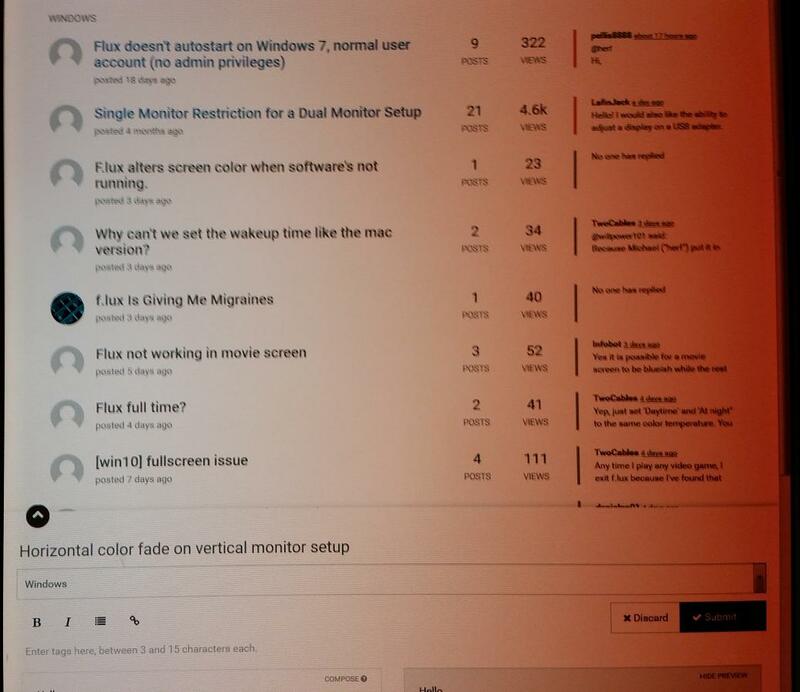 I was wondering whether that's f.lux's doing and it's just not taking into account a vertical monitor setup or whether the screens' quality is just not that great (I don't think these are expensive screens by any measure). The actual effect is nowhere near as drastic as my phone captured it and I can still work without major distractions, but I'd prefer if there was a better way. This is normal for LCD and LED monitors. It's just that it's far easier to notice when f.lux has warmed up the color temperature. It's caused by what most people would refer to as "the viewing angle". Look at the monitor from a different angle or a different location in front of it, and you'll see it change with you as you move. I see, thanks for clarifying. Guess I'll have to get used to it. Yep, that's unfortunately the way it is. I forgot to say too that it's also more pronounced because the monitor is sideways.